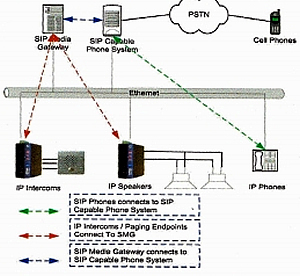 Digital Acoustics’ SIP Media Gateway (SMG) interfaces IP7 Intercom and Paging End-Points to SIP 2.0-capable VoIP Phone Systems. SMG facilitates intercom, overhead paging and door/gate release operations from central office telephones or remotely using mobile phones. The modular, IP edge-device design provides for superior scalability in applications of all sizes-assuring success today and in the future.